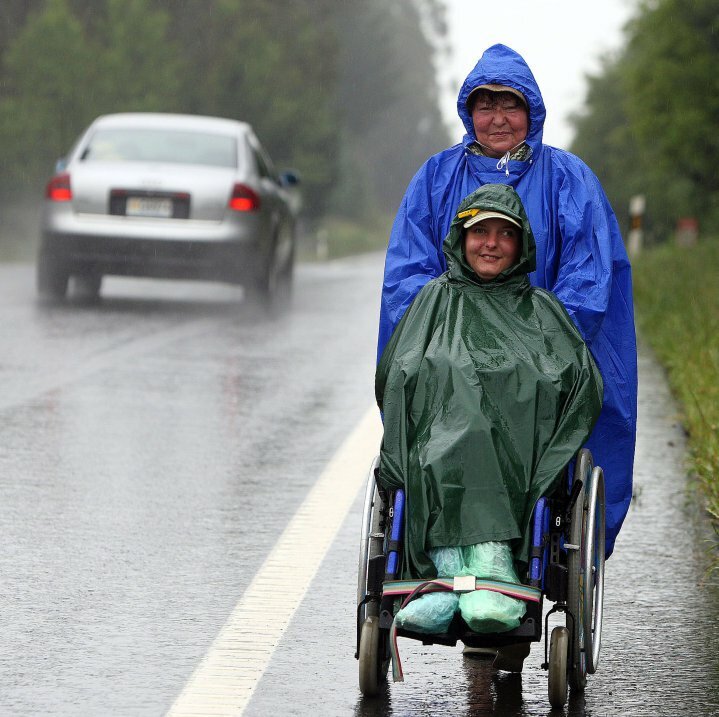 "They asked us - how it feels to walk, walk and walk and then the finish. To get to Santiago... 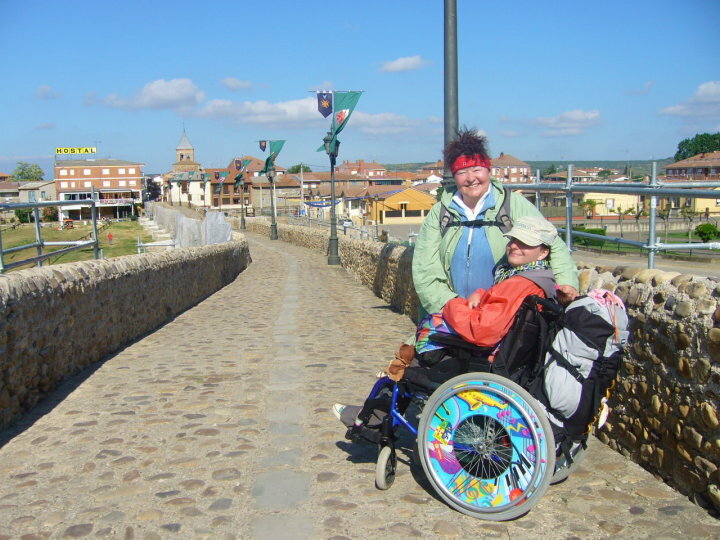 I do not know exactly how to answer, but I know for sure that the main purpose of the pilgrimage is not Santiago, the way itself is a goal ... ", wrote my mom to all at home. According to the legend, once in Spain, a shepherd saw a glowing star over the field and everybody began to call it Compostela - a star field. They say that they buried the remains of Apostle St. James here. People worshiped this place and the city was slowly expanding. 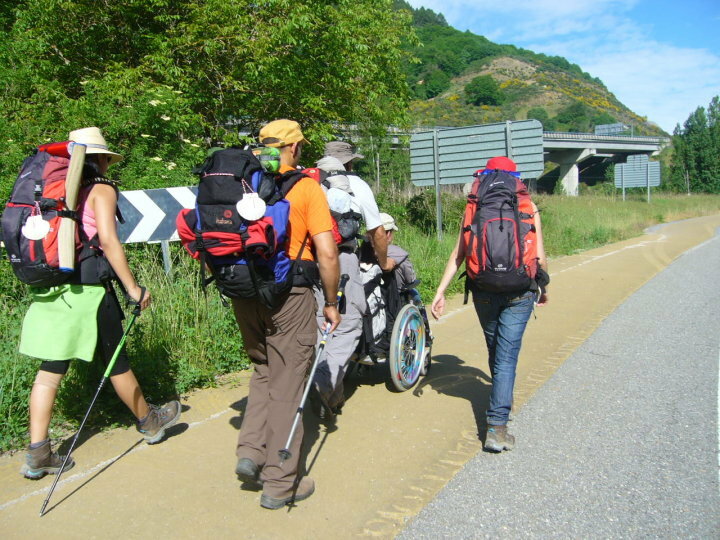 Pilgrims - .peregrinos from all over Europe have been traveling to the remains for centuries and their scallops and a walking stick have become a symbol. Camino Frances is the camino route in the northern part of Spain, full of ancient monuments, which are protected by UNESCO, and is nearly 800 km long. In the 80´s, about 5,000 pilgrims per year were registered and about 100,000 in 2005. Sometime (when Nameday falls on Sunday) they declare Holy Year. The journey starts in the Pyrenees, in the French town of St. Jean-Pied-de-Port and continues though the Spanish countryside, and a few larger cities, and ends in Santiago de Compostela. Only faithful Christians originally wished to acomplish this pilgrimage. The Apostle´s remains are in a heavy silver reliquary inside the cathedral in Santiago. As the Islamic tradition says, every believer should perform a trip to Mecca at least once in a lifetime, Christians also have their pilgrimages. One is to Rome, the other to Jerusalem, and the third is to Santiago. This pilgrimage, however, is not only for the believers these days, but for people from all over the world, they walk it for various reasons. Somebody takes the journey as an exercise, the others are motivated by faith or of spiritual reasons, because somebody is looking for himself and his way of life, someone feels that he has to get out of the roller coaster of his life. And somebody just does not know why and will figure it out on the way... The Way is special, magical and full of symbols, and you can learn how to perceive the world around you. Even my mom and I were almost for a month "peregrinos on the way to Compostela", pilgrims without their own bed, with a backpack, a sleeping bag, no television, computers, without all the devices and comfort, to which we all are used to at home. The pilgrim sleeps in different pilgrim's hostel (albergue) every night. There are albergues every 10 or 5 km. The closer to Santiago you are , more and more of them are there, but also more packed. The price of municipal albergues was in 2010 5 Euros, private 8, 10 and 12... hostel 16, 20, 25 and more Euro per bed. Only once we came across a municipal albergue with a voluntary contribution. 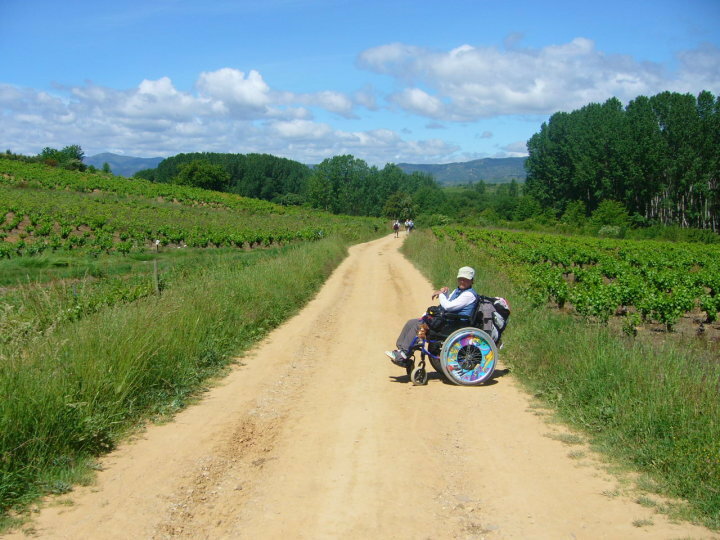 We did not know what our wandering will be like, we were a little afraid of how it would work, be "peregrinos" with a wheelchair. But pictures show that mom has not been alone for many times. 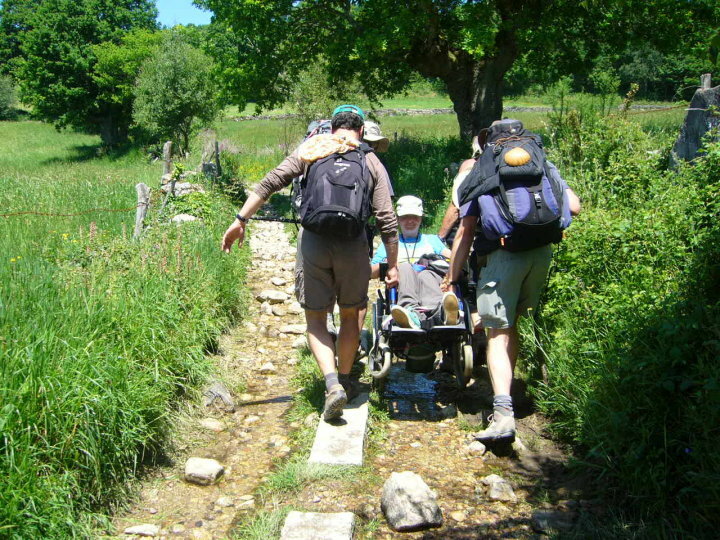 Camino is full of nice people, Four Frenchmen carried me over the stone path and then they were replaced by four Germans later. 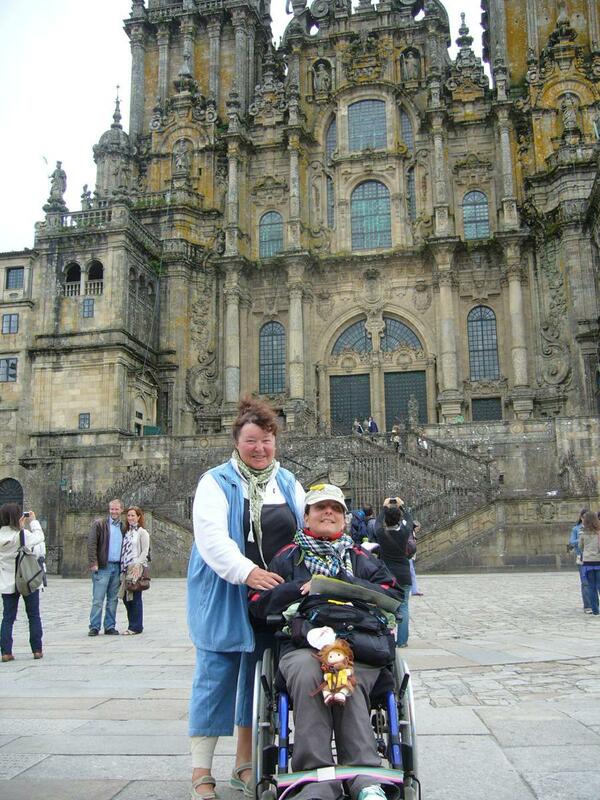 Several times, a pilgrim returned to us to help my mum with the wheelchair, because he came across a difficult road. Amazing experiences full of humanity and complete strangers become almost best friends... a pilgrim from Australia helps the other from Canada. 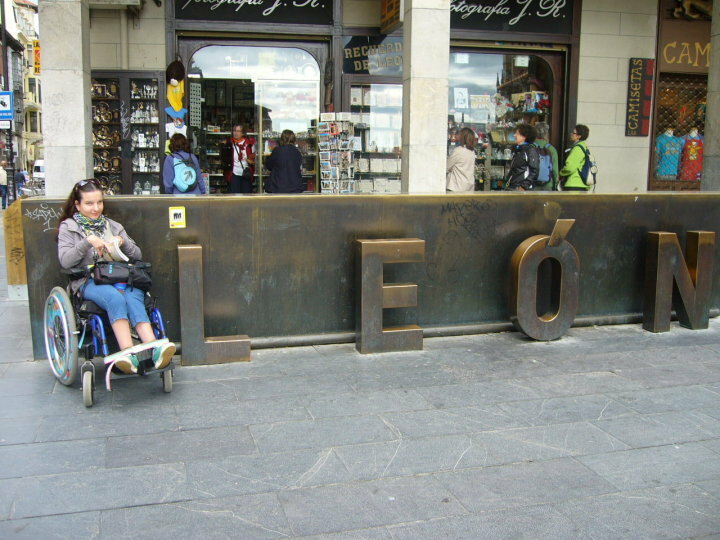 On our way to Compostela - we started from León, where it was flat, sunny and hot, other parts were windy and mornings in Galicia were foggy. But we also remember raining for 5 days. 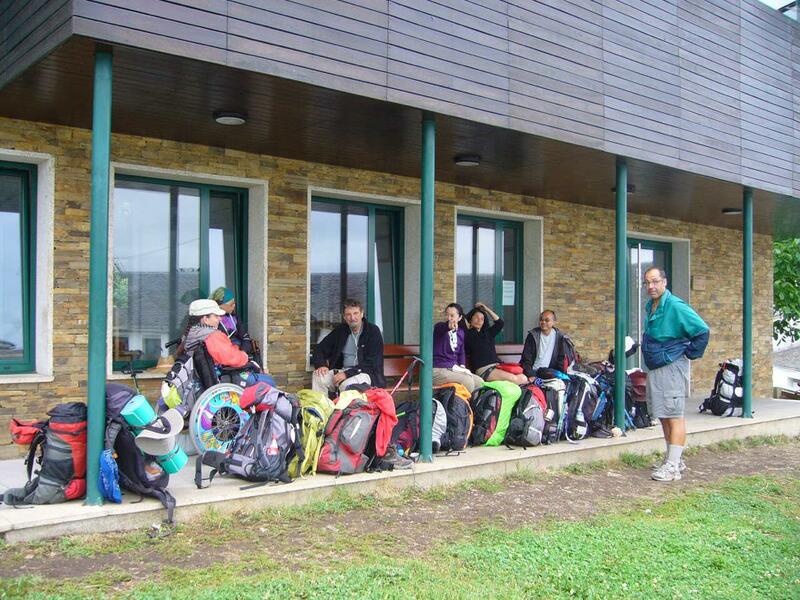 We said to ourselves, "Don´t whimper, that´s Camino!" We walked through vineyards with low crooked trees, groves of eucalyptus, passing past herds of cows, horses, sheep and everything was guarded by dogs. We visited medieval cities, cathedrals, churches, and little chapels from centuries ago ... there is not a church tower without the nest for storks. We admired old stone houses and special fences made of thin stone slabs. 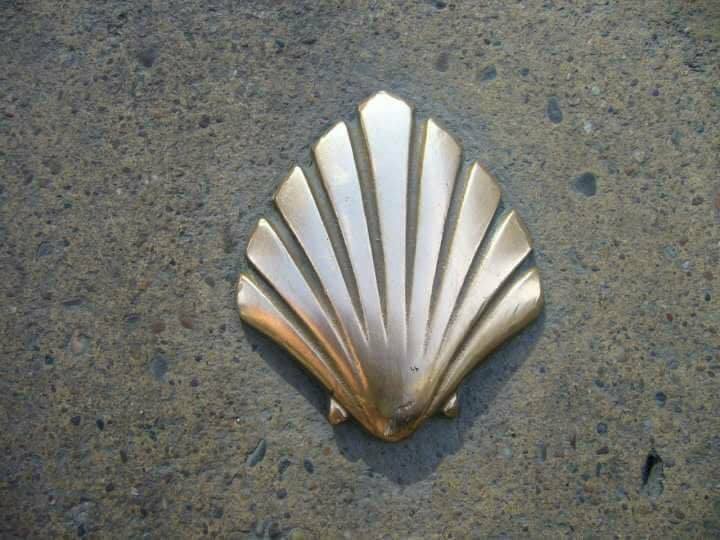 We were looking forward to all milestones, the yellow arrows and the metal scallops that led us to Compostela. The landscapes, weather, and pilgrims kept changing. We met some "peregrinos" several times, like the Danish painter Martin, who was looking for love and the Austrian Ursula, who had been going for the second time and still complaining, two students from Florida with their legs full of blisters that were still cold. the wild and beautiful Roma from Argentina with her friend Eva of Brazil, who was still laughing, the old Japanese Yoshi, and the wife of Juki, who made origami. Also the Spanish Laura with her father Nemesie and her uncle Javier, who broke a corkscrew on their knive and mum opened their wine several times with my Swiss Army knive. ... A nice meeting with Irish Caroline was pleasant. We met her for the first time in our very first hostel, and then at the end of our trip in Santiago. We sat for a long time and talked about the pilgrimages. The cathedral with the remains of St. James, two squares, and a fountain with straddling horses can be found in its center. In a stone building (camino office) where we presented the "credencial" a pilgrimage card, and got a Latin written certificate about our pilgrimage accomplished. In the beautiful and completely packed cathedral the Mass was served for us - pilgrims. 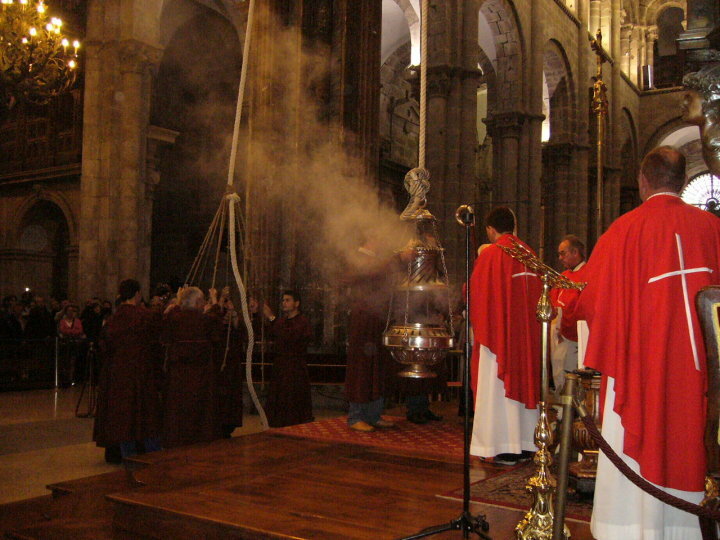 Singing, praying and watching "botafumeiro," being moved by seven priests and then almost flying though the nave on thick rope attached to the ceiling. A few nice encounters with familiar pilgrims, the last greetings of Buen camino, we laugh, we hug ... and our "club" is falling apart. Mom, Buen Camino, and thanks for taking me along to your pilgrimage ... it was one of the most beautiful and unusual experiences of my life. To subscribe to new posts? Sign up for free. You don't want to create an account, then simply enter the email and send it.